Ocus in uair aill… na baidb biraigh banghalis’. Your dwelling-place, and forests far remote. Life on this hand and that, and death between. And scorn to spare the life that shall return. “…for the belief of Pythagoras prevails among them, that the souls of men are immortal and that after a prescribed number of years they commence upon a new life, the soul entering into another body”. If the body is exposed on the field to be devoured by the birds of prey’. And them cast to the vultures believing this bird to be sacred’. The removal of flesh from corpses, which is well documented in the Celtic world, had a mortuary significance that differed greatly from the Greco-Roman practices (Soprena Genzor 1995: 198 ff.). The last 25 years of research have revealed how interments were the culmination of previous very complex rituals. 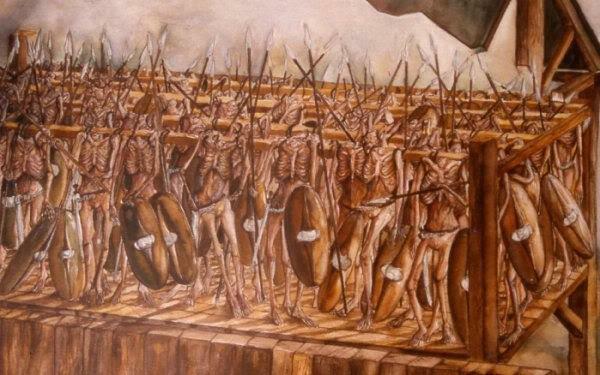 The removal of flesh before interment is clearly attested at Celtic sanctuaries like Ribemont (Brunaux 2004: 103-24), but the enormous deficit of interments, especially in the late La Têne period, can be partially explained by the exposure of corpses with the consequent destruction of most of the skeleton. This exposure ritual was a genuine self-sacrifice, as the enemy who had taken the life of the warrior, just as the bird of prey who devoured him, was merely the hand of the god (Soprena 1995; Brunaux 2004: 118-24). 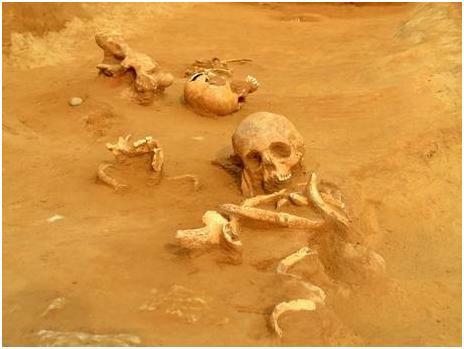 Recent excavations, such as those at Ham Hill in Somerset (England), have provided further evidence of the Celtic practice of excarnation – the ritual exposure of corpses to the elements and scavengers. The finds at Ham Hill include ritualistic burials – arrangements of human skulls as well as bodies tossed into a pit, left exposed and gnawed by animals and Birds of Prey. At the site “hundreds, if not thousands of bodies”, dated from the 1st or 2nd century AD, have been found treated in this fashion. This shrine/sanctuary was erected on the site of the Battle at Ribemont (northern France), where around 1,000 Celtic warriors are believed to have died. The victorious Belgae erected this shrine to celebrate the great battle, decapitated the bodies of the defeated warriors taking the heads home with them as trophies. The headless corpses and thousands of weapons collected from the battle field were hung from a large wooden platform (‘Tower of Silence’). Evidence of weathering and dismemberment of the dead at the site, and others such as Ham Hill, is consistent with the well documented Celtic religious practice of exposing corpses after death to be devoured by Birds of Prey and carnivores (Soprena Genzor 1995: 198 ff.). 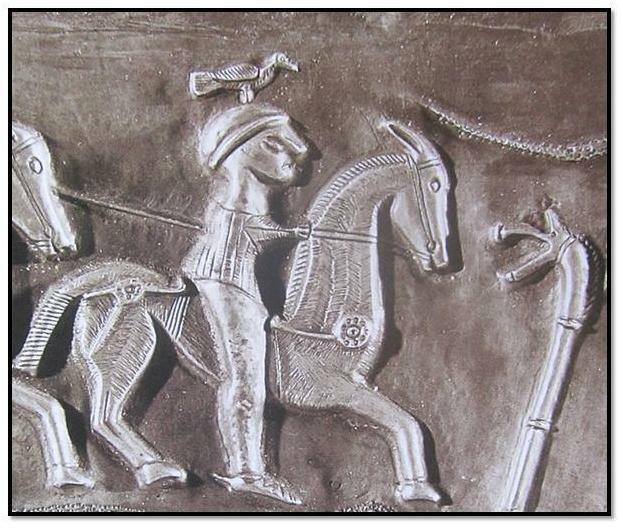 On the Balkans, the same ritual is described by Pausanias (X, 21, 3) in connection with the Celtic migration into the Balkans at the beginning of the 3rd c. BC. Celtic warriors who fell in battle during the invasion of Greece were likewise left exposed to be devoured by birds of prey, consistent with the religious practice outlined above (Churchin 1995; Mac Congail 2010: 57). 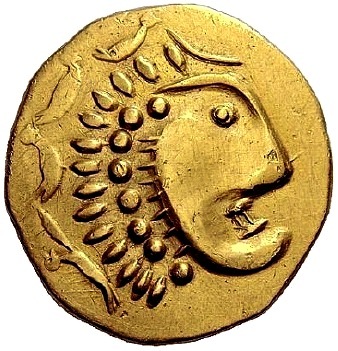 In light of the significance given to birds of prey in Celtic culture it is interesting to note the ‘name’ of the leader of the Celtic offensive on Greece at the beginning of the 3rd c. BC, the same as that of the chieftain who led the Celtic tribes who sacked Rome a century earlier – Brennos. It is unlikely that this is coincidence, and it appears that Brennos was not a personal name, but a military title given to the overall commander of a Celtic army drawn from different tribes. The term comes from the Proto-Celtic *brano- (Matasović R. 2009; Mac Congail 2010: 54-59), and means literally The Raven. 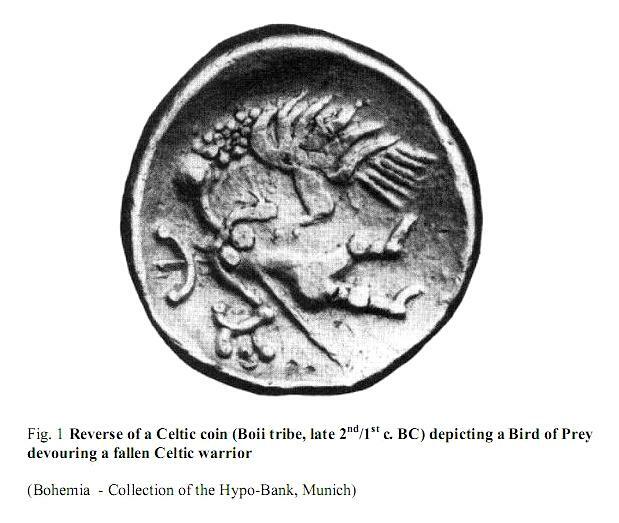 The importance of the raven, and birds of prey in general, in Celtic culture and religion is archaeologically confirmed by their frequent appearance on Celtic artifacts and coins. 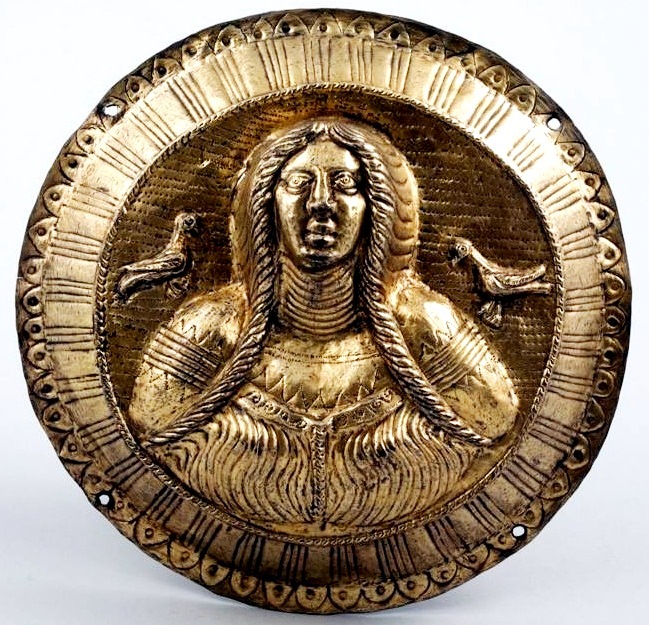 For example, of the more than 500 Celtic brooches with representational decoration now known, from Bulgaria in the east to Spain in the west, more than half depict birds (Megaw 2001: 87). 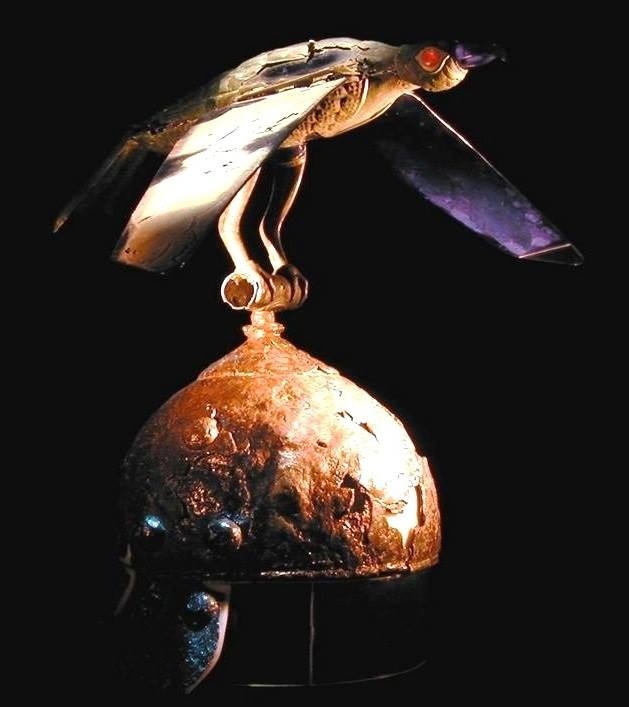 On the Balkans, birds of prey also appear on artifacts such as the Celtic helmet from Ciumesti (Romania), similar examples of which are depicted on the Gundestrup cauldron, produced by the Scordisci in northwestern Bulgaria. 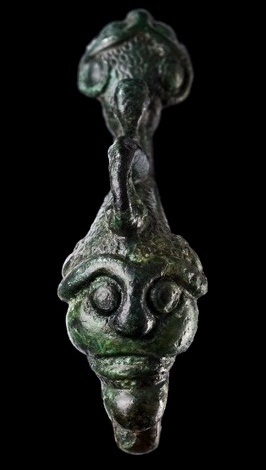 Depictions of Birds of Prey are also found on the Celtic chariot fittings from Mezek in southern Bulgaria, and Balkan Celtic sacrificial daggers. The Celtic Mother Goddess – the Morrígan / Morrígu, was a triple goddess, appearing as a trinity consisting of Macha, Anann and the Badb. The Celts believed that the Badb/war-goddess, or more accurately the mother goddess in her war mien, appeared to warriors slain in battle in the form of a bird of prey, most often a crow or raven (O h’Ogain 2002: 22; Mackillop 2004:30; Mac Congail 2010: 72-76). Her presence was not only a symbol of imminent death, but to also influence the outcome of battle. Most often she did this by appearing as a crow/raven flying overhead, and would either inspire fear or courage in the hearts of the warriors, or, in rare cases, join in the battle herself. This aspect of the goddess was known as the Catubodua (battle-raveness) which survived in later Celtic tradition as the Cathbhadhbh or Badhbh Chatha (loc cit). 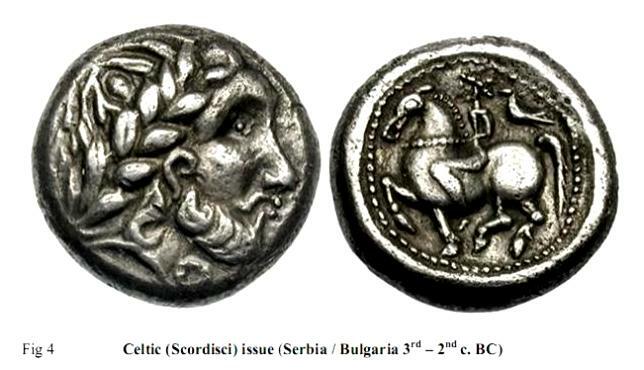 From Bulgaria, Serbia, and Hungary originate Celtic coins (of both the Philip II (fig. 4/5) and Paeonia models (fig. 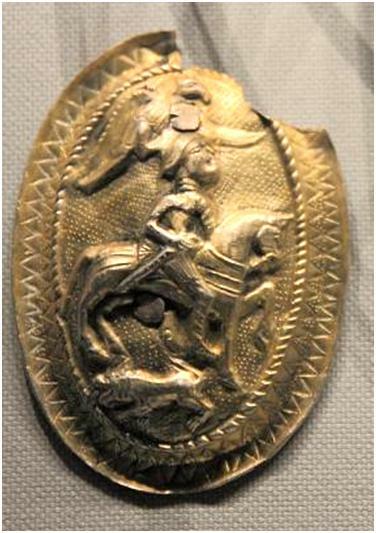 6/7) on which a Bird of Prey is depicted behind the left shoulder of the horseman, accompanying him into battle. 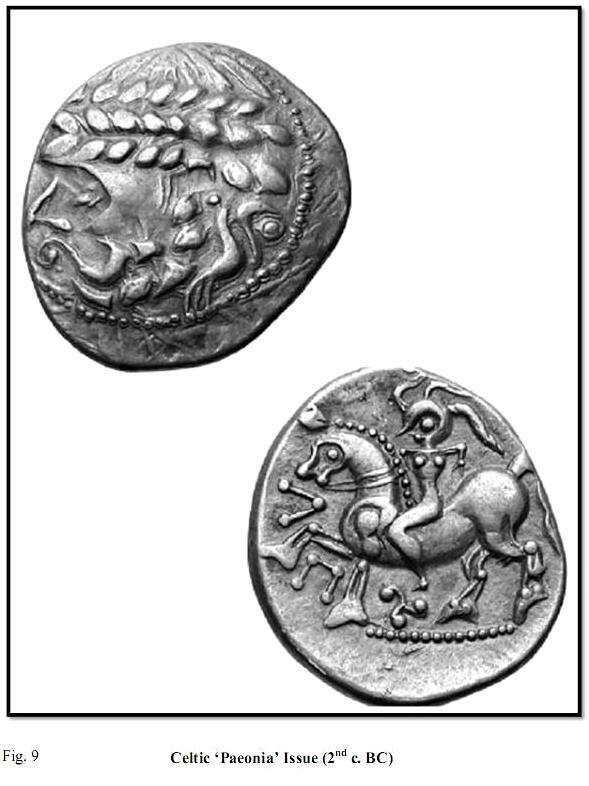 The presence of the triskele on the Paeonia model coins in particular confirms the religious nature of the images. On the vogelreiter type (fig. 7), from the 3rd – 2nd c. BC, the horseman himself is portrayed as a skeleton, the ‘deathrider’ again accompanied by a Bird of Prey. 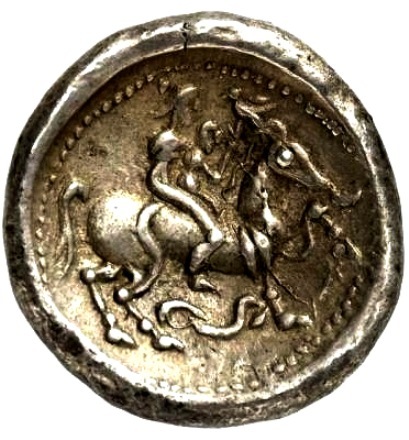 This theme is also represented on other Celtic coins from the Balkans, with depictions of the mother goddess – the Morrígan (Great Queen) in her personification as the Badhbh Chatha / Battle Raven. 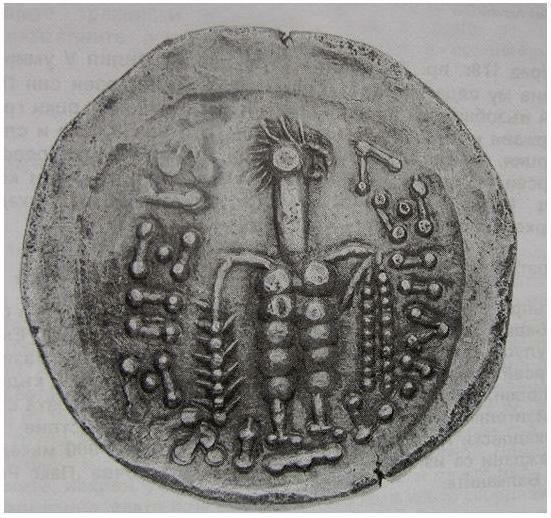 Such is the case, for example, with her portrayal on Celtic ‘Thasos model’ coins from Bulgaria (fig. 8), as well as some of the Paeonian ‘imitations’ (fig. 9). In fig. 9 the obverse portrays the central theme of transformation of the goddess, while the reverse is packed with religious symbolism, including the triskele symbol and Celtic inscription. The central image again portrays the mother-goddess in her personification as the war raven – Badhbh Chatha. 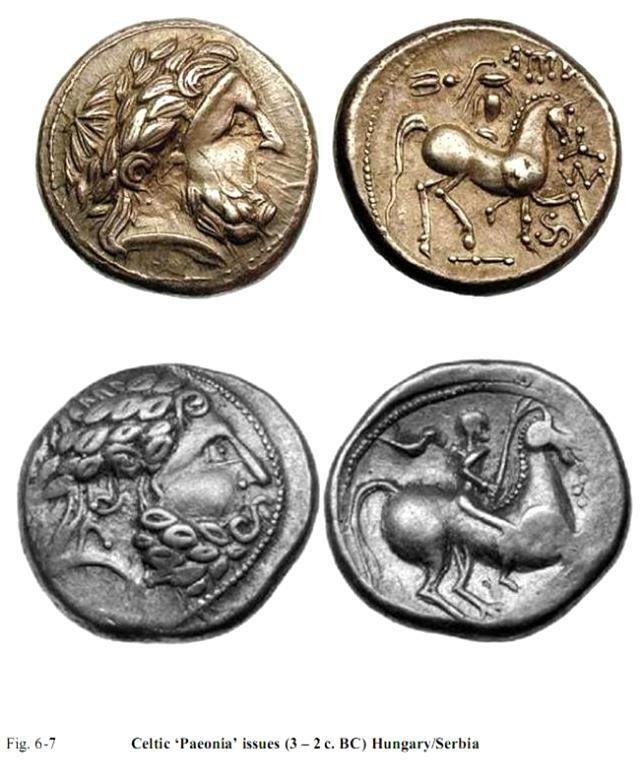 THE THREE REALMS – Reverse of a Celtic tetradrachm from southern Hungary (2nd c. BC), depicting a horseman, child and bird of prey; representing the 3 phases of life in Celtic belief – childhood, adulthood and death/transition. Brunaux J.L. (2004) Guerre et religion en Gaule. Essai d’anthropologie celtique. Paris: Errance. Soprena Genzor G. (1995) Ética y ritual. Aproximación al estudio de la religiosidad de los pueblos celtibéricos. Zaragosa. Marco Simón F. (2008) Images of Transition. The Ways of Death in Celtic Hispania. Proceedings of the Prehistoric Society 74, 2008. Pp. 53-68. Megaw V., Megaw R. (2001) Celtic Art from its Beginnings to the Book of Kells. London. Ó hÓgáin D. (2002) The Celts – A Chronological History. Cork. 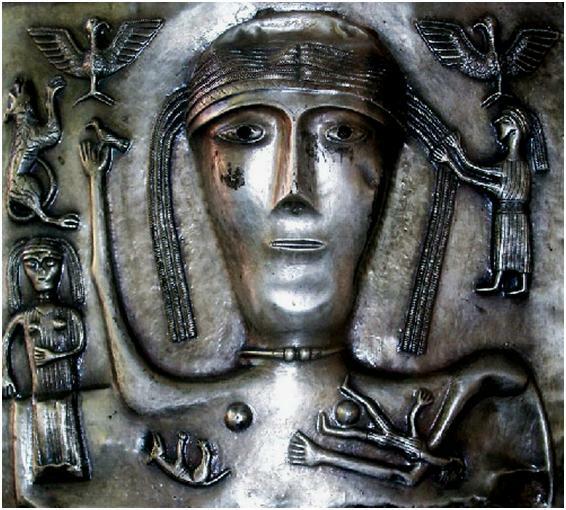 I would like to use some of your images of the Gundestrup cauldron in a paper: plate f and the bird helmeted horseman. Who has copyright? 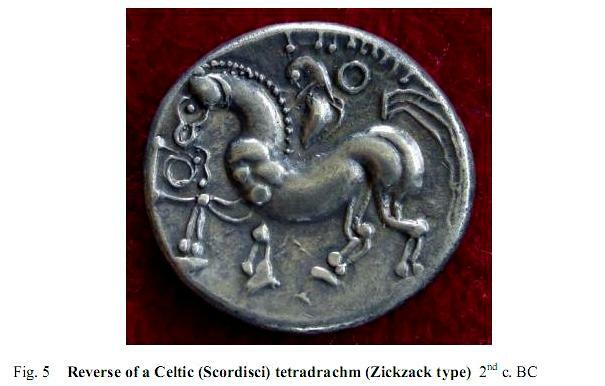 Nobody has copyright on Ancient Celtic artifacts. Public domain. Feel free to use any images from Balkan Celts, David.